Purpose: Use this document as a reference for understanding how the Calculation Results page within the Maintain Faculty Workload component is loaded, changes upon recalculation and can differ in appearance from Contract Type to Contract Type. 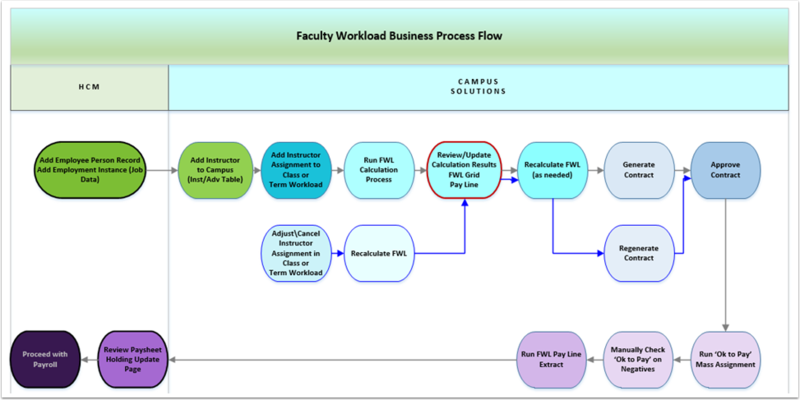 The FWL Calculation Results page is part of the Maintain Faculty Workload component, which is the heart of the Faculty Workload process in that it serves as a "workspace" to store pertinent data. The Calculation Results page exists in the same component as the FWL Grid and CS to HCM Pay Line and is half-way through the FWL process. The page is refreshed each time a calculation is performed. 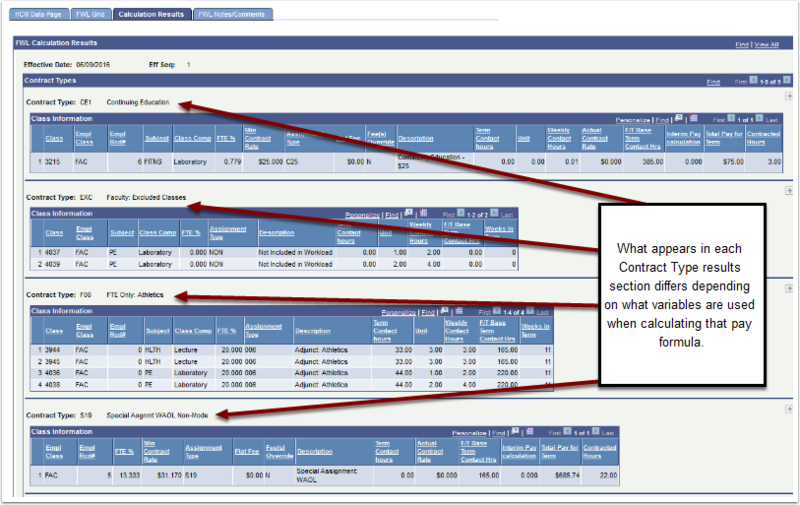 Contracts where changes have occurred will appear with new data, those without changes will simply be carried forward so that the latest record shows the Calculation Results for all current Contract Types. All results on the page are display only as all changes that would impact a contract are made on the FWL Grid page. The FWL Calculation Results page stores the relevant variables used in each calculation. The results displayed vary by contract (pay formula), meaning the fields you see on the results page will be different depending on how each contract is calculated. If Term Max Load Rate is used in the calculation, it will appear in the result for that contract, but if Minimum [hourly] Rate is used, then this will display rather than the Term Max Load Rate. The FWL Calculation Results page, like each page in the Maintain Faculty Workload component, generates a new 'current' view with the Effective Date of the initial calculation or recalculation. If more than one recalculation occurs on the same day, the Effective Sequence number increments up. Upon first accessing the FWL record, only the latest Effective Date/Effective Sequence data is visible In the upper, right hand corner of the page the user can click through each Effective Sequence on the latest Effective Date to view the calculation history that occurred on that latest Effective Date. To view all Calculation Results every generated for the term, click the Include History link on the button, left hand corner. In the example below there are two Calculation Results visible with the Effective Date of 06/09/2016. When Include History is clicked, the record count goes up to 5. The Calculation Results will be displayed regardless of whether the calculation generates pay. In this way the user can see when the system calculates and excludes classes from pay or generates FTE% only to record a Full-Time Faculty regular load. Note: The Calculation Results appears after the FWL Calculation Process is run. For information on how to run the FWL Calculation Process in batch to load the FWL Grid and Calculation Results, refer to the Quick Reference Guide - FWL Calculation Process (Batch).